This school year is the 10th since I was the Chairman of the Primary and Secondary Education Subcommittee on the House Finance and Appropriations Committee. It was during that committee process that we developed (among other national award-winning education reforms) the so-called Evidence Based Model of school funding -- Ohio's most serious attempt to address the Ohio Supreme Court's four rulings determining that Ohio's education funding formula was inadequate at calculating the cost of educating Ohio's 1.7 million students and relied too much on local property taxes to fund. Among the promises made in that package was a 10-year, phased-in funding plan. We picked 10 years because 2009 was the height of the Great Recession, which limited the additional revenue we could commit to the plan initially. But I required that the state publish the 10-year full funding version so that the public could at least hold future legislators accountable to fully fund the thing. Here is a look at the research that backed each of the funding elements in the EBM. As you can see, there was evidence behind the model -- a far cry from today's "formula", which isn't really a formula in the classic sense. Even with the limited additional revenue, EBM was beginning to work. The second year of that plan was the only time in Ohio history that more state than local revenue paid for Ohio's public education. After the 2010 election, though, Gov. 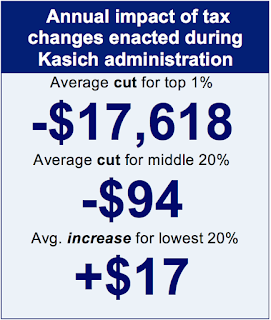 John Kasich killed the EBM, replacing it with a plan that initially cut money to education by about $1.8 billion. He then developed his own school funding plan, which was so despised that his own party rejected it in 2013. Ever since, Ohio has essentially created arbitrary per pupil funding increases, which bear no relation to the actual cost of educating kids. 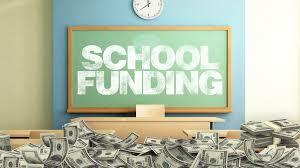 However, that may be changing soon as state Reps. Robert Cupp and John Patterson have been working on a plan that sounds eerily similar to me, basing funding on what kids need and trying to reduce the need for local property taxes to pay for it. And that's all I've ever asked: Figure out the cost, pay for it and don't force us to go to the ballot every couple years to pay for your poorly calculated formula. I don't care what you call it. Just do it. Given the historic nature of this school year, I wanted to show everyone what the EBM would have provided districts and what today's formula provides. Only about 10 percent do better under the current formula. And 90 percent do worse. Usually significantly worse. For example, Cleveland receives $144 million less today than they would have under the EBM. Think that would have helped CMSD implement its Transformation Plan? Instead, they've had to rely on local philanthropy and an historically huge local property tax hike to do not even all of what the plan called for. For a district-by-district rundown of all the state's school districts, visit the spreadsheet I've posted here. Now some may say that coming up with the $1.7 billion difference between a fully-funded EBM and what the state current spends is an outrageous amount. 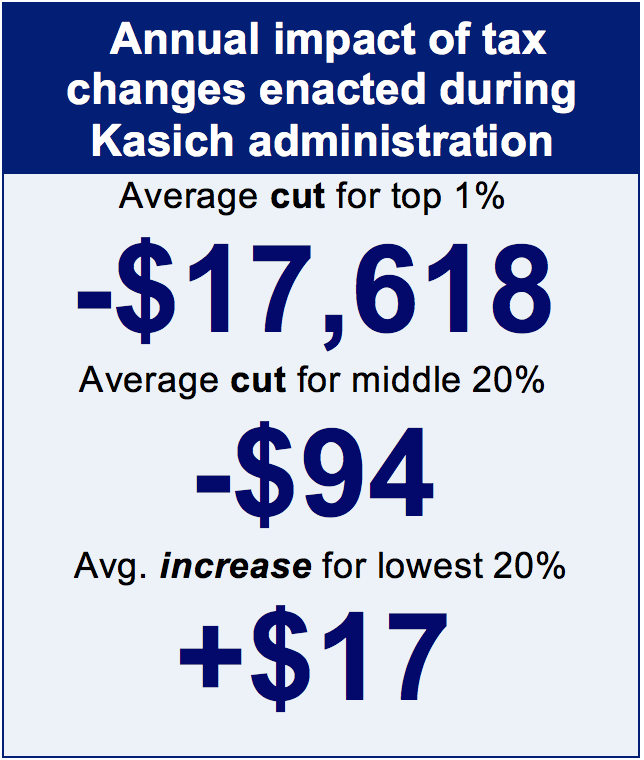 However, the state now has at least $3 billion fewer today than it could have because of various tax cuts that the state has instituted, especially during the Kasich years. So we could have paid for a fully funded EBM if we had only cut taxes half as much. It wouldn't have required an additional income tax increase or anything. Just not as big a tax cut. That's all. And I bet you haven't even noticed the tax cuts. That's because the wealthiest 1 percent has seen a $17,618 tax cut. Regular folks have seen a $94 cut. And the least wealthy among us have seen an increase. That's right. Give back half of that $94 and your property taxes could have been dramatically cut by an average of $240 a year (depending on where you live, it could have been MUCH more than that). Look, I get that finding money in this budget will be a challenge. I understand that given the makeup of the General Assembly and Governor's mansion, this will be a heavy lift. But I also know that two House members are genuinely trying to get this right. I see a new House Speaker who lives in the school district where the DeRolph school funding case originated and probably feels like he has some unfinished business on school funding. But most of all, I get that our kids need us to deliver for them. A new formula based on what kids need to succeed in the classroom and beyond. A mechanism that doesn't force voters to tax themselves at higher and higher rates every couple years. A system we can all be proud of. Ten years ago, we were on our way to accomplishing that. Maybe over the next 10 years we can finish that mission. Just as a personal aside, when I did EBM, my oldest son was in Kindergarten and my youngest had just been born. At the end of the coming two-year budget cycle, my oldest son will be driving and my youngest will be getting ready for middle school. It is ridiculous that we are working on our third generation of Ohio students whose educations we've failed to properly fund or even calculate. It's now no longer for my kids' sake we need to get this right. It's for the generation behind them. Stephen Dyer is the Education Policy Fellow at Innovation Ohio. He also practices law in the Akron, Ohio area. Previously he was the State Representative for the area and the Chief Legislative Architect for Ohio's Evidence Based Model of school funding, among other things.